My quest for finding new Transformers has been hard fought, but it’s finally started to produce some results. 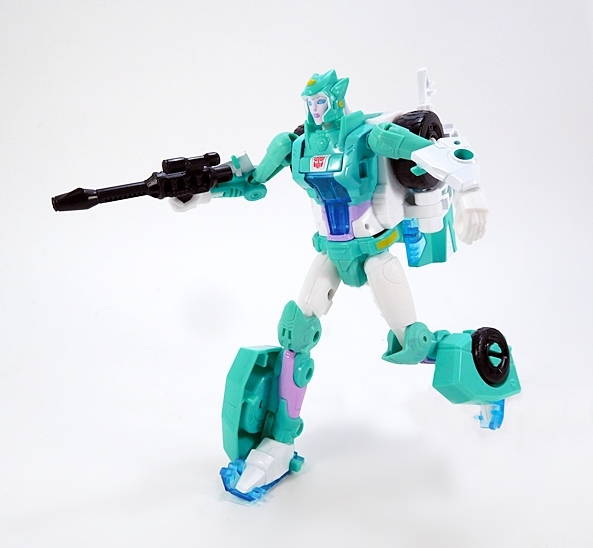 Last week I checked out the first of the Terrorcons, Rippernsapper, and today I’m having a look at Autobabe Moonracer. 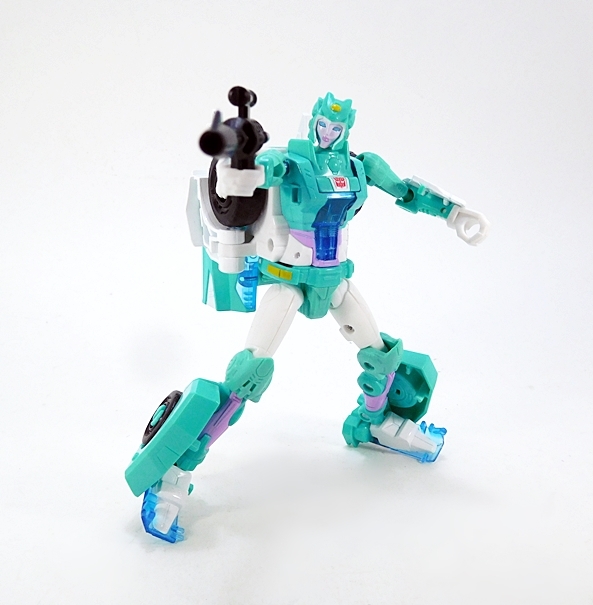 I’ll confess that I’ve wanting figures of Moonracer and her cohorts ever since I first saw The Search for Alpha Trion. I was also disappointed we didn’t get more of her and her companions in the cartoon. 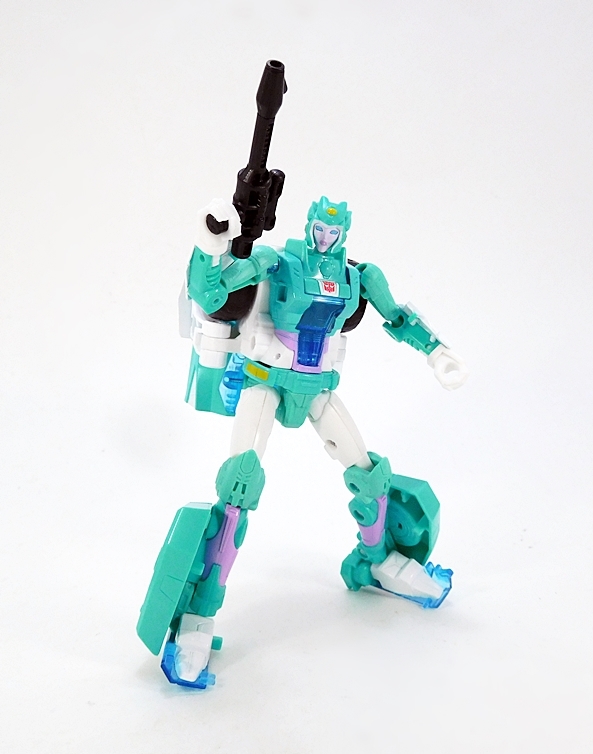 Well, here we are decades later and Hasbro has begun to turn up the love for the femmebots. 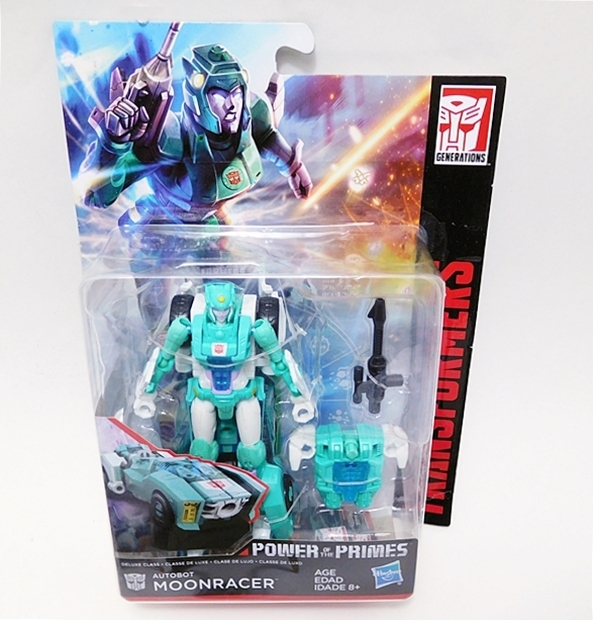 We got Arcee and Chromia a few years back, and now we’re getting Moonracer and Elita-1 in Power of the Primes. Was it worth the wait… Mmmm, maybe? Oh yeah, apologies in advance for the pictures. I didn’t realize at the time how badly her white parts were going to blend into the white background. I really should have shot her with a gray or black backing, but I didn’t have time to do a complete re-shoot. Here she is in the package and the character art looks great… but boy is it misleading. 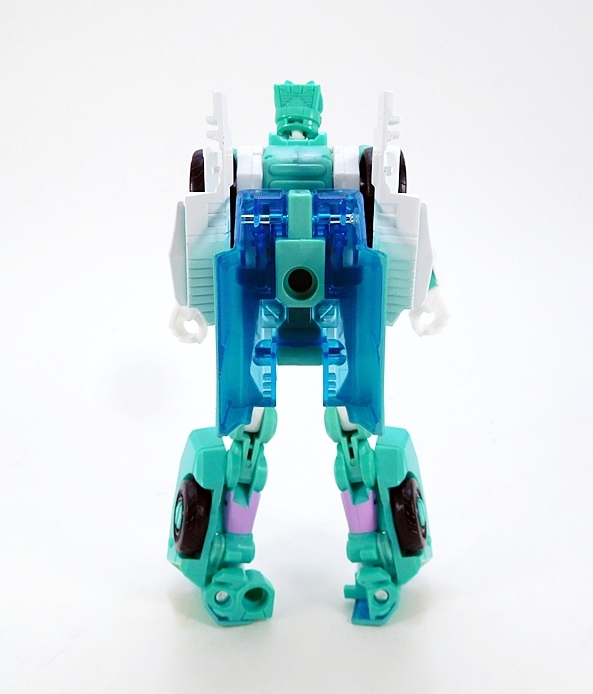 If you look closely you can see Moonracer has a rather shapely femmebot profile that somewhat matches her animated look. You can also see that in no way does she have a crippling block of kibble welded to her back. You can, however, kind of see from the packaged figure that isn’t really the case and believe me you ain’t seen nothing yet. But I’m getting ahead of myself. Let’s start with her alt mode. Moonracer is a futuristic car and not a bad one. She’s very long and pretty thin and has a pretty sleek styling that is a bit reminscent of a Formula-1 car. 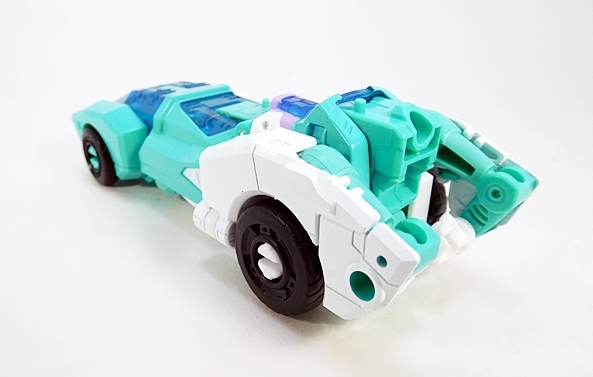 There are a number of tinted blue panels on the top, making it hard for me to decide which is the canopy for the driver’s compartment, because none of them open like on the Titans Return figures. I’m guessing it’s the one near the front. Or maybe none of them are, since this is probably supposed to be a Cybertronian vehicle? 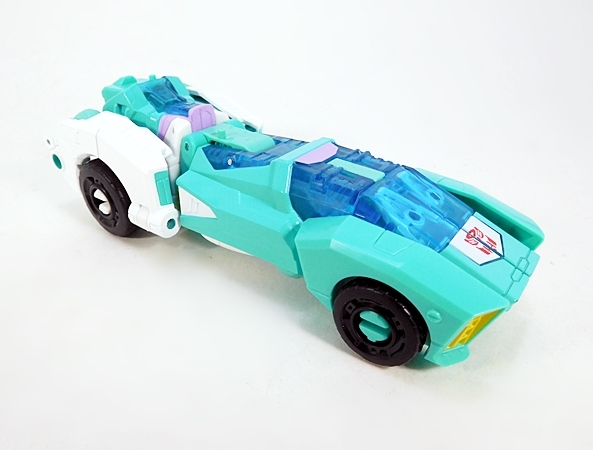 In addition to those tinted blue pieces, the bulk of the car’s deco consists of teal plastic with some white plastic in the back and some lavender paint hits. 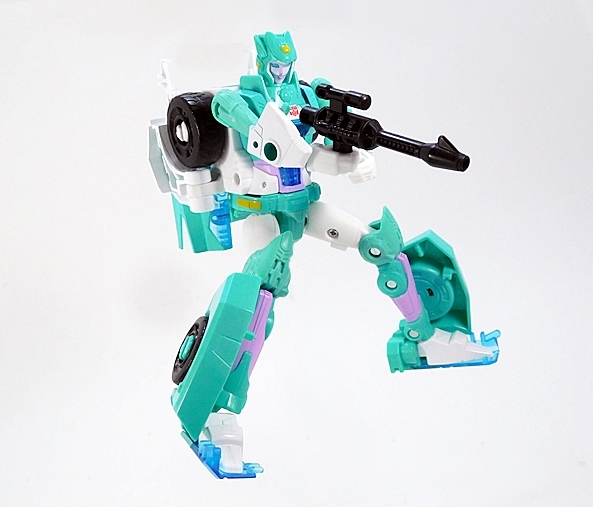 I don’t think she has the personality of Arcee’s convertible mode or the sexiness of Chromia’s lightcycle mode, but it’s fine. I like the front, especially the addition of the yellow paint apps for the headlights. She also has an Autobot insignia printed on her hood. 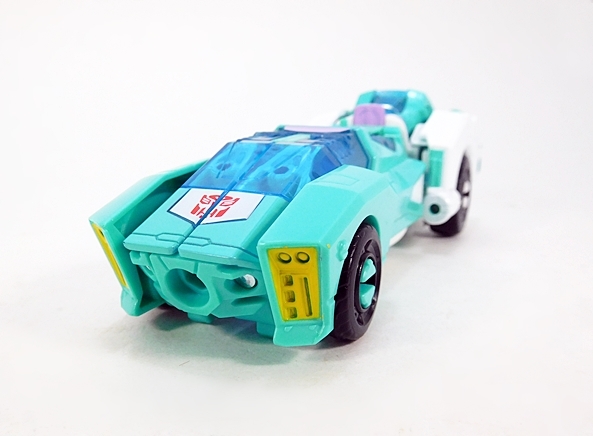 There’s a very obvious socket in the front of the car that hints at her combiner capabilities, but I dig it as just part of the car’s weird design. I will say that she doesn’t roll all that well, as some of the undercarriage hangs pretty close to the ground. From the front, Moonracer isn’t too bad, but she’s still got some issues. For starters, you can see in her mid-section where they sculpted the hourglass shape that they wanted her to have, but behind it you can see that it’s just faked out and she’s got a rather blocky torso. The legs are fine, and they have that nice rounded organic look to them, but she has those two awkward quarter-panel shells from her alt mode just jutting out on each of her lower legs. Hey, at least they help to make her enormous feet look a little smaller. I’m also not a fan of having those windshield pieces on the bottoms of her feet. 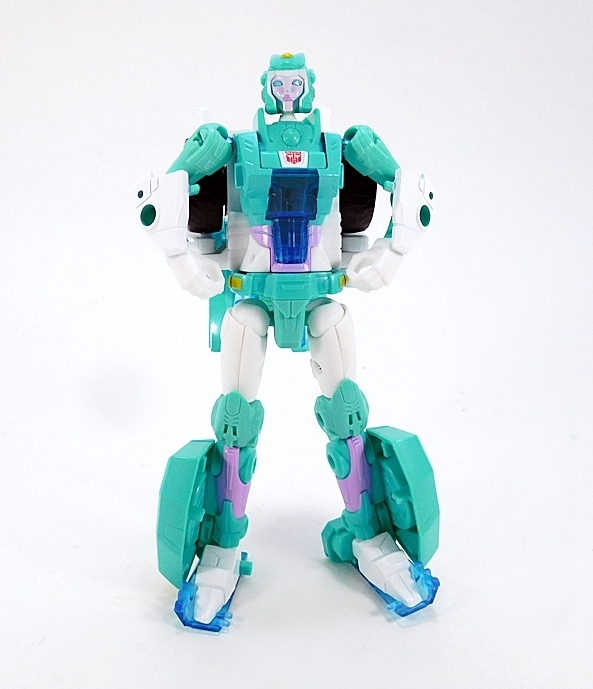 As for the deco, well the teal and white goes well together and she also has a splash of lavender and a tinted blue cockpit showing in her midsection. I think the coloring is a nice approximation of her animated look from the original cartoon. As a rule, I don’t have a problem with my Transformers wearing backpacks. It’s a convenient place to pack away kibble, but this? Yeah, this just isn’t acceptable to me. 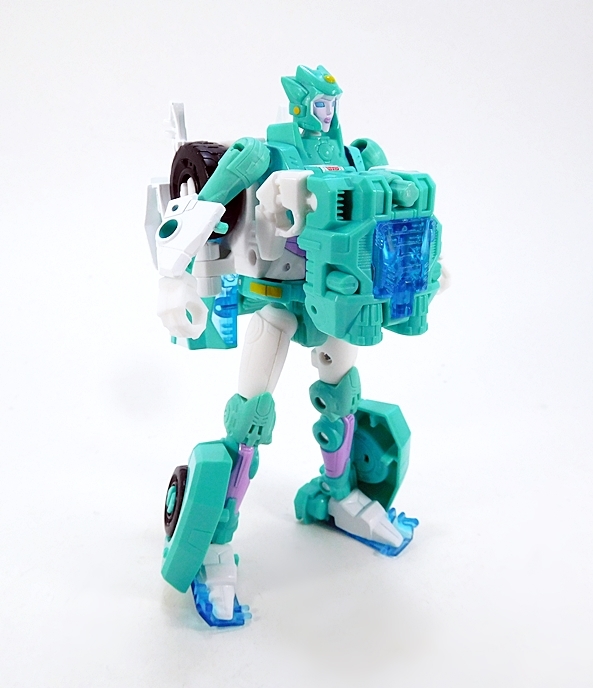 Poor Moonracer’s backpack is so damn big that she had to be mis-transformed in the package so the figure would fit in the bubble. When I opened her up, I was shocked at this amount of back kibble and then I realized that I still had to fold another piece into it and make it bigger. Surprisingly, she’s not too back-heavy. I’m thinking that those quarter-panels that protrude off the sides of her legs help to counterbalance her a bit. I do like the head sculpt a lot. 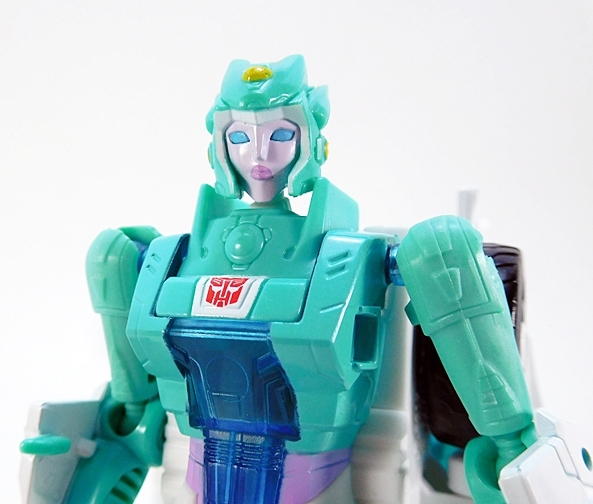 The “helmet” has a curved design that matches the Sunbow femmebots and also has a certain flavor from the animated movie designs. The eyes are big and blue, although they do look a little too scared to fit her character. She was kind of the wisecracker and here she just looks worried or surprised about something. Alas, the paint on my figure’s lips is pretty uneven. It looks like they just blotted it on there without much thought. In fairness, you do have to get in pretty close to see it. And if Moonracer isn’t bulky enough for you, you can always take her Prime Armor piece and attach it to her chest. The less that I say about this gimmick the better. 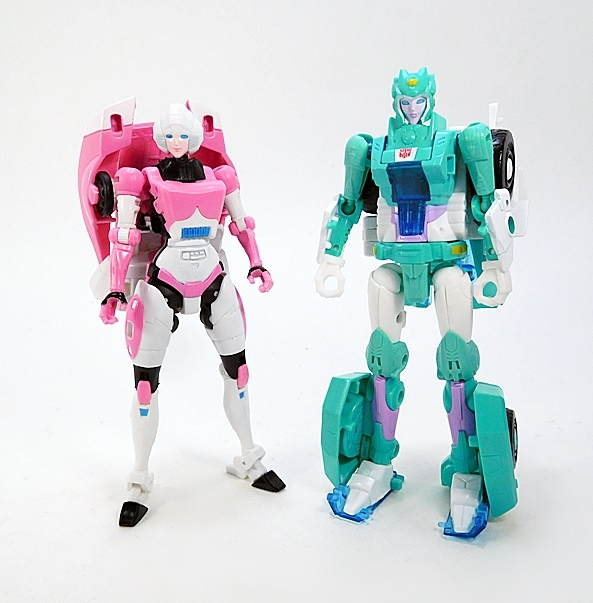 I couldn’t put my hands on my Chromia in time for this review, but here’s a shot of Generations Arcee with Moonracer. Obviously, Arcee isn’t perfect and she’s got a sizable backpack as well, but I just like the way they dealt with it so much better. It’s completely separate of her body, which still manages to capture the animated femmebot aesthetics. Plus even her backpack features contours and curves, making it feel more like part of the design. 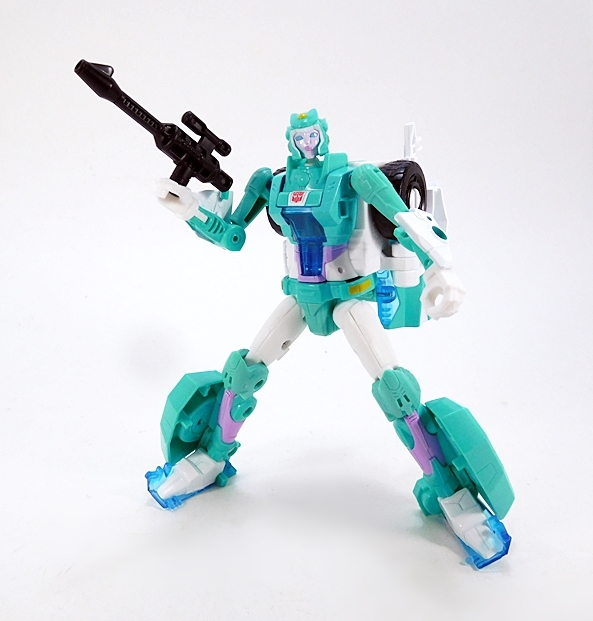 Granted, Arcee is a shell-former and Moonracer is a combiner, and that has to add a lot of obstacles to the design, which is all the more reason I wish she wasn’t. After such a long wait, I want to say that Moonracer is pretty disappointing. But at the same time, I can’t say that I have buyer’s remorse. 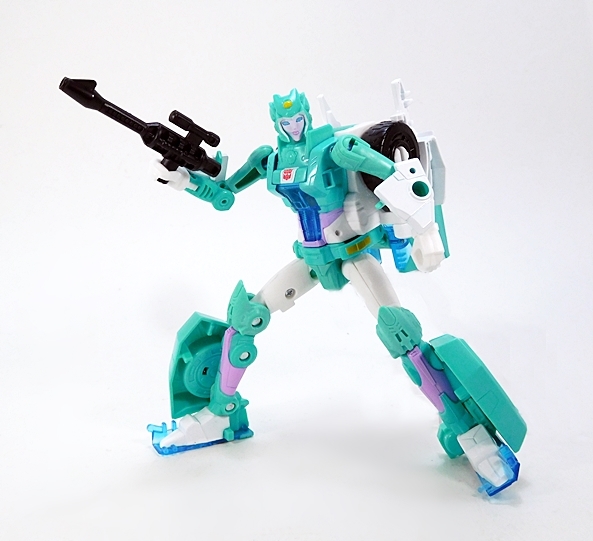 I’ve wanted a figure of this character for a long time, and I have to sympathize with the challenges that Hasbro had designing a Deluxe Class figure that could match the animated look of the character and still transform and fit their (weird and IMO unnecessary) rule that all Deluxes have to be combiners in this line. Moonracer isn’t a total dud. 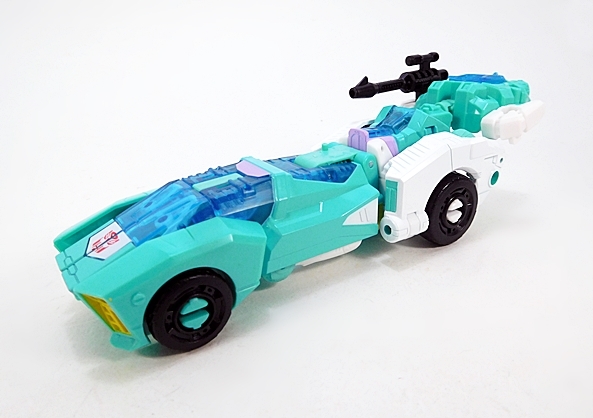 There are things I dig about her, but when you consider that Hasbro could have redesigned her car mode to look like anything, maybe they could have met in the middle with a better compromise between robot and alt mode. In the end, it’s cool that they made her and I’m happy to have her, but boy am I glad I didn’t wind up paying a premium for her. 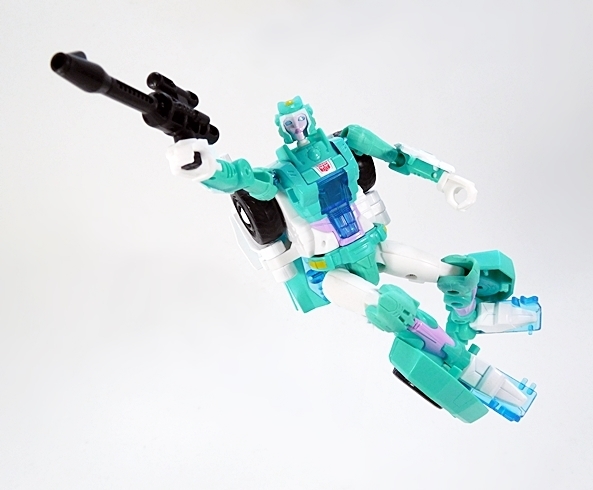 I normally woudn’t have bought Moonracer but there’s, like, no Transformers in town. So when she showed up I bought her for lack of options. She’s OK.
Oh man, TF Con sounds like fun. I’m jelly! It’s not a question of “which Fanstoys will I buy” but “how many”. Generations Arcee isn’t really a shellformer, too much of her torso and legs go to making the alt-mode.